Exterior PVC products, as close to maintenance free as it can ever be! Products designed for the exterior of your home must consider the elements. We work with natural woods favored for exterior applications AND we work with cellular PVC, a very low maintenance wood alternative. A virtually up-keep free product, cellular PVC mills similar to real wood but will not rot, warp or split and termites hate it! 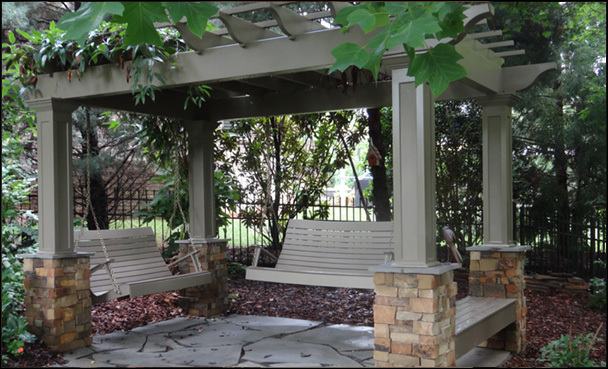 Pergolas, Arbors and other outdoor structures: This can be a great start for your “outdoor room”. This structure can add architectural interest, privacy and partial shade. We use cellular PVC reinforced with aluminum to create your unique custom design. It can be free standing or attached to your home. Columns: several styles and materials available to complete your project, including fiberglass & exteria board. You can add cloth canopies, lighting, curtains, and ceiling fans to this area. Custom shapes available. Railings & Newel posts: Advanced manufacturing in North Carolina plant. Low maintenance PVC Railings are assembled by hand using traditional tools and practices used for generations, including glues and mortise and tenons creating beautiful long lasting and secure product meeting the highest quality standards. We offer a standard square baluster but can easily manufacture Chippendale or other specified architectural baluster patterns for you. Window Planter Boxes: A perfect accessory for the exterior of your home. Add splashes of color and natural beauty of plants and flowers with our high quality window boxes. Custom sizes available and two drainage holes plus brackets included with each box. Our North Carolina manufacturer has been making custom window boxes for over 15 years using high grade composite PVC, heat presses and folding technology to create a lasting seamless high quality box for your home or business. Our custom planter boxes (standard or custom designs available) are a simple way to add instant curb appeal and a charming personal touch. Let us help create the proper accents on the finest livable home space – directly outside.